Show your Tiger band spirit by wearing FHS Band spirit wear and/or displaying a garage sign with your band member’s name. The FHS Band Boosters are pleased to offer a wide range of ways for you to show Tiger pride for your band member. All profits directly support the band. Fishers Band spirit wear is ordered through Go Tell Graphics. Availability for ordering will be announced via our directors, Spirit Wear Chairs, and the newsletter. You can also check the News section below for details on specific order dates and details. Select the option FHS Music Dept Garage Signs. Now you’re ready to place your order – just follow the “5 Easy Steps”! (2) UPS Ground to customer address, for a fee. Signs cannot be delivered to the school. 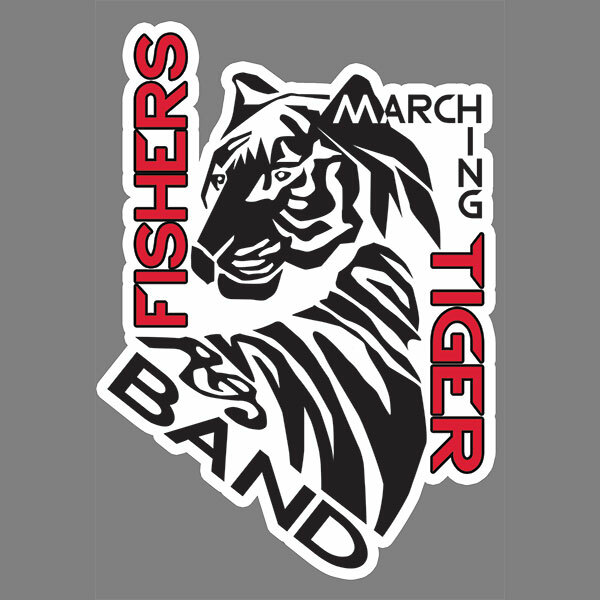 Show your Tiger pride when you’re on the move with a FHS Band car decal. Each 4” x 5.5” decal has a white background (shown here black for demonstration purposes), and sells for $10. To order, contact spiritwear@fishersband.org. Limited quantities. While supplies last.